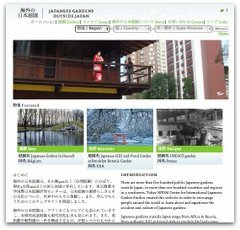 In a special biodiversity issue, The Kyoto Journal published my short essay called “Inviting Totoro to Tokyo.” The article celebrates Miyazaki Hayao’s (宮崎 駿) wonderful illustrated book “The Place Where Totoro Lives.” In illustrations, words and photos, Miyazaki portrays Tokyo residential districts village-like atmosphere and potential for wildness and mystery. Miyazaki imagines a city that can welcome Totoro by showing rare wood houses, the stories of their occupants, contemporary streetscapes, and how they can be transformed by creating an urban forest. At Shizen restaurant in Sendagaya, I was impressed by the very simple flowers in this lovely vase. I love how the ceramic is made to appear “torn.” Whether bonsai or ikebana, Japan excels at using small-scale nature to evoke much large landscapes and experiences. My perception of Tokyo has been completely altered by the wonderfully perceptive Fixes blog. It truly seems that all of Tokyo is held together by the amazing S-hook. Like my previous post, this hanging pot relies on an S-hook to attach itself to the existing built environment. In this case, there’s a double S-hook for added stability. The plant is decorating the narrow space between two old buildings on a mostly commercial stretch of a large boulevard. I love how someone has intervened in the landscape, and done so in a way that is completely removable and dependent on what already exists. I like how someone has hung this simple plant, commonly called “wandering Jew” in the United States, on the fence in front of this empty lot. The lot has been empty for at least two years, a long time between demolition and reconstruction. The fence occasionally changes, but it was especially nice to see some plant decoration. In the context shot below, you can also see that someone planted a simple hedge on the right side. My guess is that both of these plant interventions– one in the ground, the other secured by a simple S-hook– were created by neighbors who are getting tired of seeing the empty lot and its weeds. I admire this anonymous, small contribution to the neighborhood. Anyone know the name of this flowering weed? Does anyone know the name of this flowering weed? 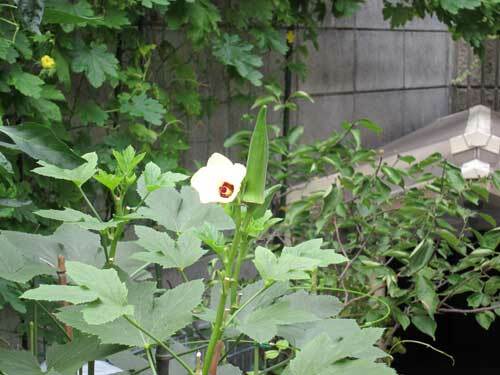 It started growing out of our balcony satoyama box, and suddenly it reached two meters tall, intertwining itself with the morning glory on the green curtain. At first I wasn’t sure if it was an intentional plant, and then it started blooming. The flowers almost look like jasmine. During the time I was documenting it and before I could post about it, I recently visited the University of Tokyo Botanic Garden (also called Koishikawa Botanic Garden). It’s a lovely garden, which I will post about soon, that traces back to 1684. Although full of history and botanic treasures, this Botanic Garden is also a bit overgrown with vines choking out the azaleas. I am curious if anyone knows the name. I am guess it is very invasive. Do you think it is a satoyama plant or a kudzu-like danger? I love how these sunflowers are growing at the intersection of two small streets, and how the round flowers echo the larger, convex street mirror. The flowers grow in a tiny scrap of soil just outside the wall around a residence. After preparing the image, I realized that I took a similar photo last year. When my friend Stokes told me about the wildness in Nishi Azabu Juban, I was somewhat incredulous. He was staying briefly at a childhood friend’s house there, and quickly discovered narrow lanes and uncultivated yards and odd spaces that he insisted on showing me. The neighborhood is in central Tokyo, and includes both very expensive homes alongside more modest, old timers’ residences. In what must be a planner’s nightmare, late summer weeds are pushing out of cracked concrete steps, barely paved lanes lead to houses, and the urban forest seems ready to reclaim the land. There is something comforting to feel wildness in the center of the city, the impermanence of the built environment, and the power of the unplanned. I love how this narrow Nishi Azabu Juban bar is defined by the street tree out front. The bar and tree are named カクレミノ (kakuremino, or Dendropanax trifidus). The building front is largely glass and wood beam, with the tree providing some privacy and mystery. The tree has been espaliered so that it grows in barely two dimensions. According to Wikipedia, this evergreen tree is native to lower Honshu, Shikoku, Kyushu, and Okinawa. This incredibly narrow garden in Nishi Azabu Juban is overflowing with plants. I love it. Most people would think there’s no room for a garden, but someone was determined to live with greenery. Technically this narrow street does not even have a sidewalk, just a narrow space between road and home. I love the many layers, textures, and colors. I am reading Lyanda Lynn Haugpt’s Crow Planet, a book about closely observing city crows that offer many insights on urban wildness. Haugpt is part of an urban ecology movement that I identify with. If city dwelling is a given for us– as it is for more than half the world’s population–how can we explore and expand our knowledge of nature from inside the city? I suspect that city birdwatching, like city gardening, connects us both with nature and with each other. I also enjoyed Marie Winn’s Central Park in the Dark, which explores bird life in New York’s incomparable Central Park. Haughpt’s work goes a step further, by suggesting that we start at our kitchen table, looking out the window with binoculars, and exploring nature on our roofs, outside our doors, and in our immediate vicinity. I like that Haughpt, a serious birder and wildlife researcher, has chosen the most humble of city birds, and made their stories integral to how we are now changing our views of city life and the relationship between humans and nature. I like her focus on the close observations of the everyday, and admire her narrative power to evoke history, myth, and natural science while reconsidering what city life is and can be. I am already feeling sad to be close to the end of this inspiring book. Although Tokyo Green Space focuses more on city plants than animals, habitat rather than wildlife, I feel a kinship in her reinterpretation of the familiar and ordinary. Has anyone else read this book? I highly recommend it.